If you’re on Sunday Bike’s Facebook feed, you may have caught this video of Wayne Keller riding his local skatepark. What you may not know, besides tearing up the skateparks, Wayne also has a thing for repurposing, remachining and generally customizing his parts for his ride. Check out his stem. He carved the top off and engraved “Dork” on it. 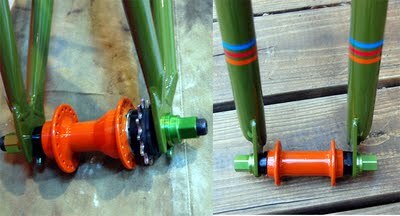 The cool paint job on both the stem and the sprocket are trick too. His hubs are also attention-getting…painted in a “can’t miss this” orange. To keep things fresh, Wayne’s redoing his bike at the moment and ditching the lime green and orange. He’s changing a bunch of his parts to different shades of grey. Check out Wayne’s blog, carrot-bag.blogspot.com/ for more updates on the constantly evolving look of his Model-C.
Great to see people customizing their rides and making them their own. 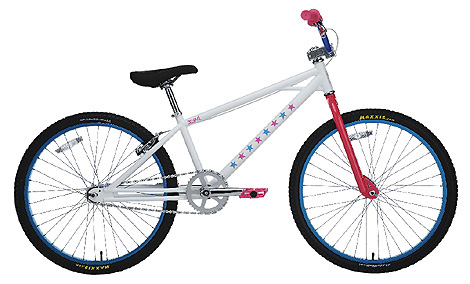 As you may recall from a previous post, where Specialized debuted the new P24 at Sea Otter, Specialized has reentered the BMX world. And it looks like they’re serious about it this time. The P24, which we featured a prototype of earlier, has been out for a little while now and it looks like they’ve done a good job of spec’ing out this complete bike. 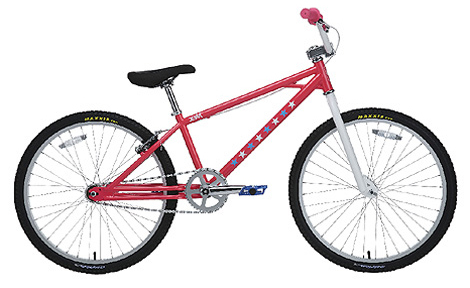 Its got great geometry, Reynolds cro-mo construction (with a 21.6 top tube) and nice, big 7 1/2″ X 29″ bars. The components also look solid and it’s a fairly light at the 26 pound mark. As luck would have it, cruiserrevolution.com reader, Buddy, recently picked up a P24 for himself and shared his thoughts on it. It feels better than any of those bikes to me. I think it’s mostly the size and geometry fits me very well, perfect, (I’m 6 feet tall). Based on the specs (and Buddy’s feedback), I think we may have another contender to consider when shopping for a new complete. Back in April, you heard about how the twin top tube was making a comeback. Well, don’t call it a a comeback any longer, cause it’s now here! 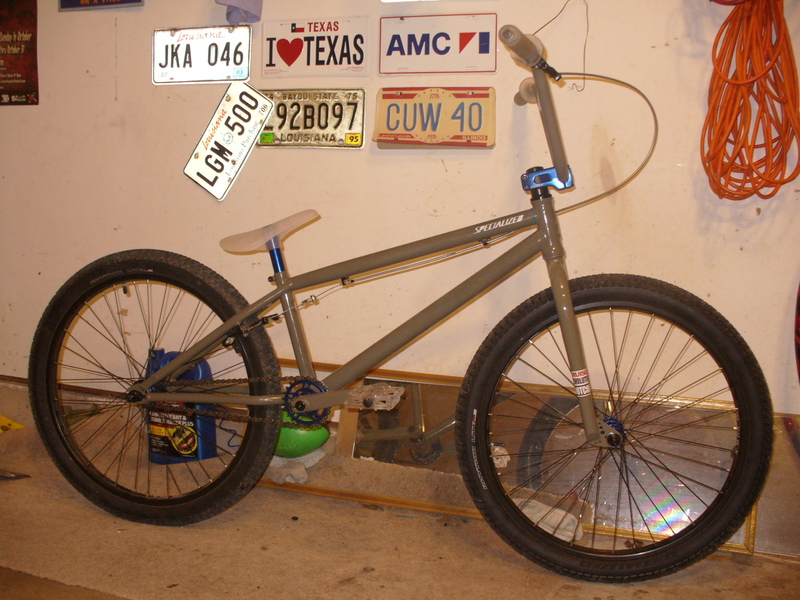 Tribute bikes has put this 24″ frame, a great combination of old school style with modern geometry, into production. I’m pretty stoked on it. What I didn’t expect was amount of color choices! 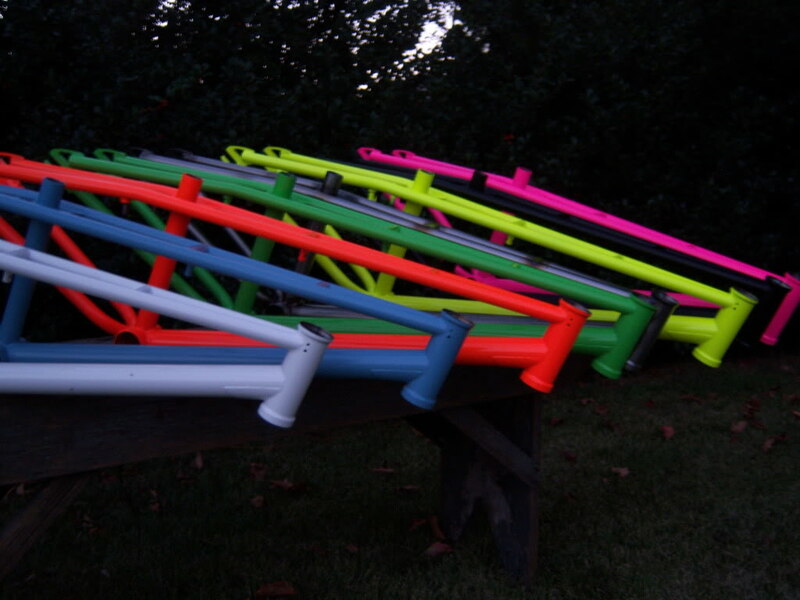 It’s available in: pink, yellow, orange, black, blue, green, white and clear powder coat options. If you’re looking for something different from what’s out there…or you’re just missing your old Haro Master or Torker this could be the frame for you. There are only 20 frames available this year (some are already spoken for) so if this tickles your fancy you may want to get in touch with Josh at Tribute Bikes right away at info@tributebikes.com. 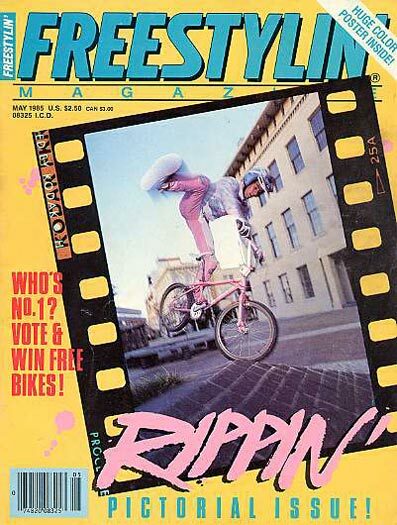 For more on Tribute Bikes check out their web page or their feature on bmxmuseum.com. As you may have gathered from my previous posts, I’m not afraid to join in the refrain of “steel is real” when people debate the pros and cons of frame/fork materials. That being said, it kind of goes without saying that, in these situations, I’m talking about chro-moly not hi-tensile steel. Sure, I get low-end completes may have to scrimp a bit and go with tri-moly or main tube chro-moly frames (the rest being steel) and steel bars. Compromises have to be made somewhere. What I have difficulty in understanding is a hard-core BMX company putting out a complete that is high-tensile steel throughout. 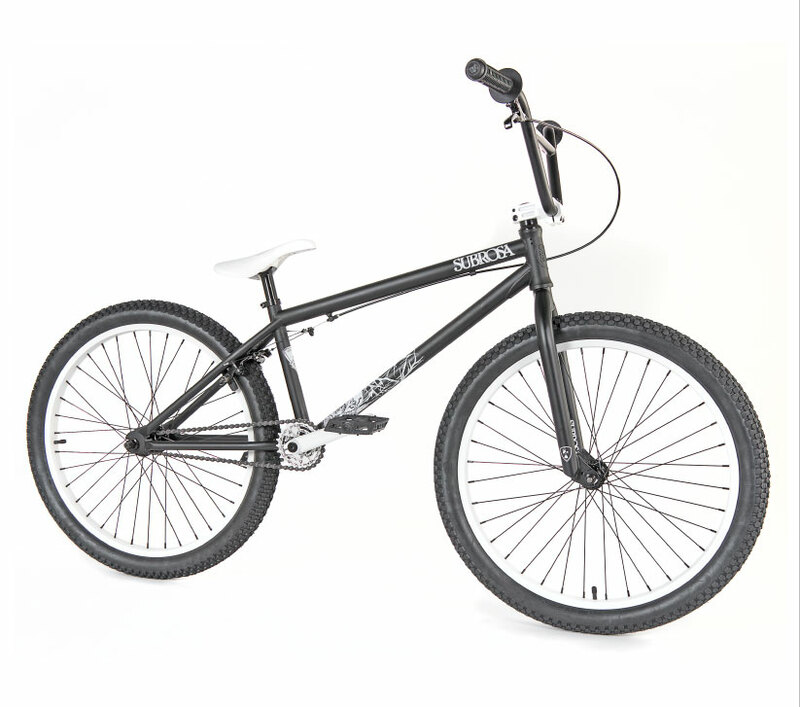 The 24″ Subrosa Salvador cruiser comes standard with high-ten frame, fork and bars. The geometry and components seem pretty good…seemingly designed for serious riding…yet the frame material seems better suited to a department store bike. What’s bizarre is that it’s spec’ed with chro-moly cranks! Well, thank goodness for that. Because once you’ve broken the frame, bent the forks and snapped the bars you’ll at least have a solid pair of cranks beneath you to carry you home. If this was part of a 24″ lineup I would kind of get it (sort of) but to have this as the sole 24″ offering from a company that should know better is pretty disappointing. These days with riders going off at the X-Games, the Dew Tour and in crazy web edits it’s easy to forget the simpler aspects of BMX. Like cruising the neighborhood with friends. This is BMX in its purest form. He’s nothing next to Bart Taylor. But it turns out that American Dad didn’t forget his time in the lumberyard either. If you’ve ever thought about a Trickstar-inspired cruiser, or were a fan of Woody Itson‘s pink Trickstar back in the day, this may be the bike for you. Check out the front end in the pictures below for the obvious Hutch Trickstar influence. Japan’s online BMX store, W-Base teamed up with x-girl (a clothing company) to create this limited edition cruiser. Only 100 were made and they have been available since April from online store Calif. There are silver, blue and black components throughout on both versions.